How to make crepes:tips and tricks (straight from a French bakery) to making delicious crepes every time! The possibilities are endless with these delicious crepes — fill them with a savory filling, sweet filling, or enjoy them plain with a sprinkle of powdered sugar. 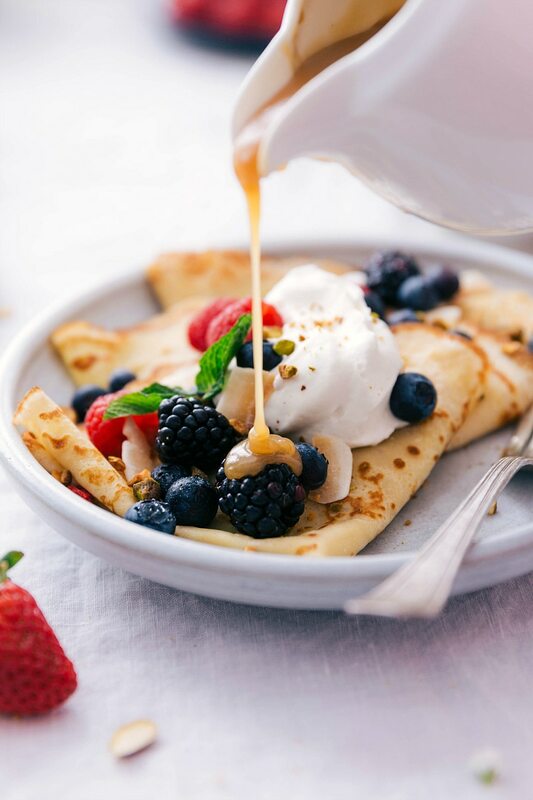 Our favorite way to enjoy these crepes is with nutella, berries, homemade whipped cream and this vanilla sauce. These banana crepes (filled with custard) are also a favorite! When I was in high school, we had the cutest foreign exchange student from France live with our family for about a year. We all fell in love with her immediately; she is the sweetest girl and fit in perfectly! Today I’m sharing the step by step process to making crepes (I promise it’s easy! ), our favorite ways to enjoy them (savory & sweet), and some tips to making crepes delicious every time. Scrape: Make sure you scrape the sides of your blender. If any ingredients didn’t mix in well, blend for another few seconds. Cooking the crepes: Once the mixture has chilled and you’re ready to make your crepes, give your mixture a quick stir. Next, lightly butter a large skillet (you don’t need a special crepe maker!) then lift the pan and pour 1/4 cup batter into pan. Immediately tilt and swirl the pan in circular motion to evenly coat entire bottom portion of pan with that crepe batter. Once the crepe is golden brown (about 1 minute), use an offset spatula to lift the edge of the crepe and flip to the opposite side. Cook the other side until golden brown spots appear. Enjoy: Add your filling(s) of choice and fold it up in half then half again to form a triangle OR just roll it up like a burrito. One of my favorite things about this crepe recipe is it makes a lot of crepes! Which is nice to “meal prep” or plan meals for your week. Once made, these crepes store beautifully in the fridge for 4-5 days. 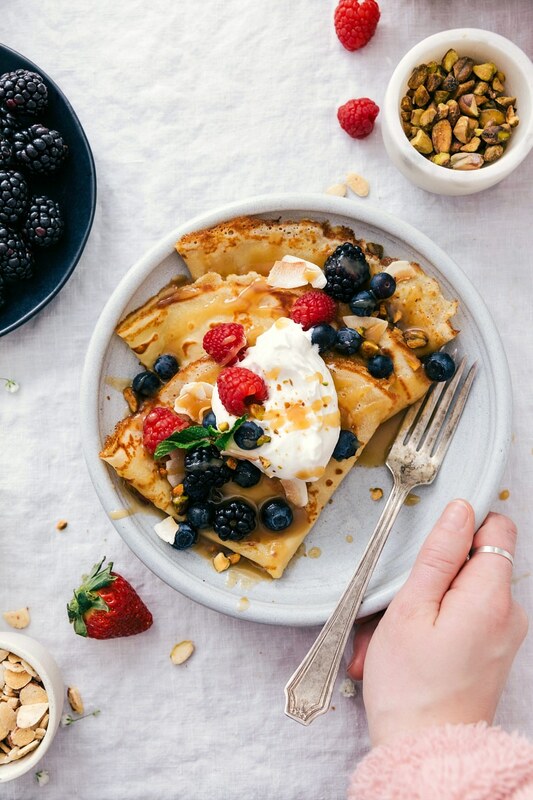 So it’s perfect to grab a couple of prepared crepes in the morning and whip together a quick (filling and healthy!) breakfast (or lunch, dinner, or snack). Below are some of our favorite ways to make a crepe into a satisfying meal. How do you make breakfast crepes? Garden Delight: fill your crepe with artichoke hearts, tomatoes, baby spinach, and parmesan cheese. Italian: fill your crepe with tomatoes, pesto, and mozzarella cheese. Traditional Breakfast: fill your crepe with ham, eggs, and pepperjack cheese. Good morning: fill your crepe with bacon, egg, a drizzle of maple syrup, and cheddar cheese. TBA: fill your crepe with turkey, bacon, avocado, mayo, and swiss cheese. Nutella: spread nutella down the center, add strawberries and/or bananas, and whipped cream. Dulce De Leche: fill your crepe with La Lechera Sauce, bananas, walnuts, and whipped cream. S’mores: fill your crepe with marshmallow creme, chocolate sauce, and crushed up graham crackers. Simplistic: spread a little butter on your crepe and add a sprinkle of powdered sugar. Custard Delight: fill your crepe with homemade custard, chocolate sauce or nutella, and strawberries. Lemon Lover: fill your crepe with lemon curd, raspberries, and blueberries/blackberries. 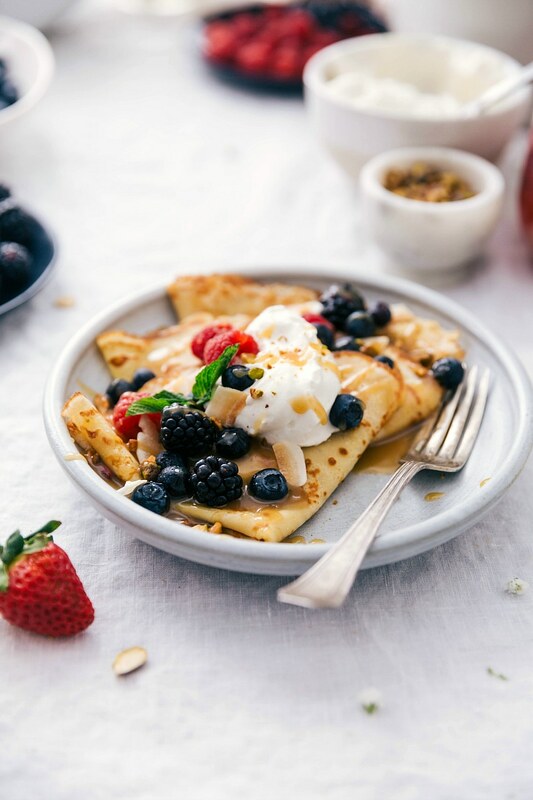 Berry Fanatic: fill your crepe with whipped cream and berries and add a drizzle of vanilla sauce. 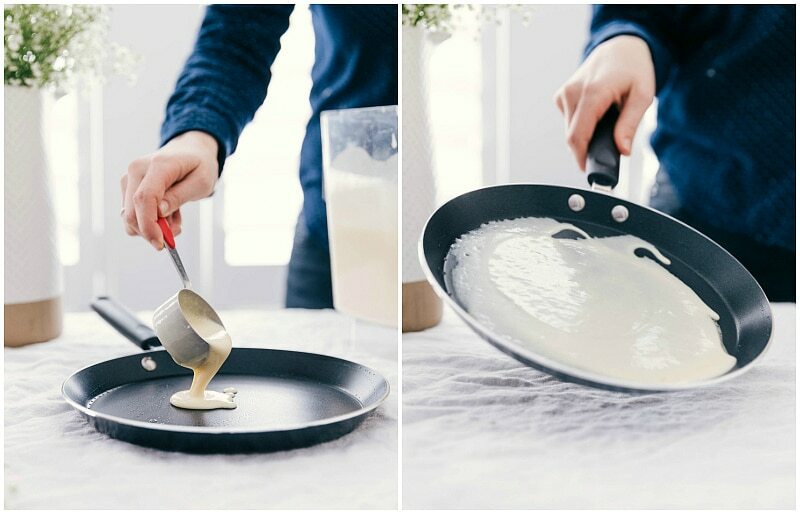 Nonstick pan: while you don’t need a special pan or crepe maker to make amazing crepes, you do need a nonstick pan! FYI: Here’s the exact pan I use when making crepes. Heat: Slowly heat the pan to the desired temp. If you try heating your pan too quickly you’ll have to constantly be adjusting the temperature trying to get it right. Don’t flip it too early: Make sure you wait until the surface of your crepe is starting to get golden brown spots, the edges have started to brown, and it is no longer shiny. If you flip it too early the crepe will tear and be undercooked. Immediately swirling the batter: It’s vital that as soon as your pour your 1/4 cup of batter onto your heated frying pan you immediately swirl the batter evenly around the whole base of the frying pan. If you wait at all the batter will start to cook immediately and you won’t get that thin, delicious crepe. How to make crepes: tips and tricks (straight from a French bakery) to making delicious crepes every time! 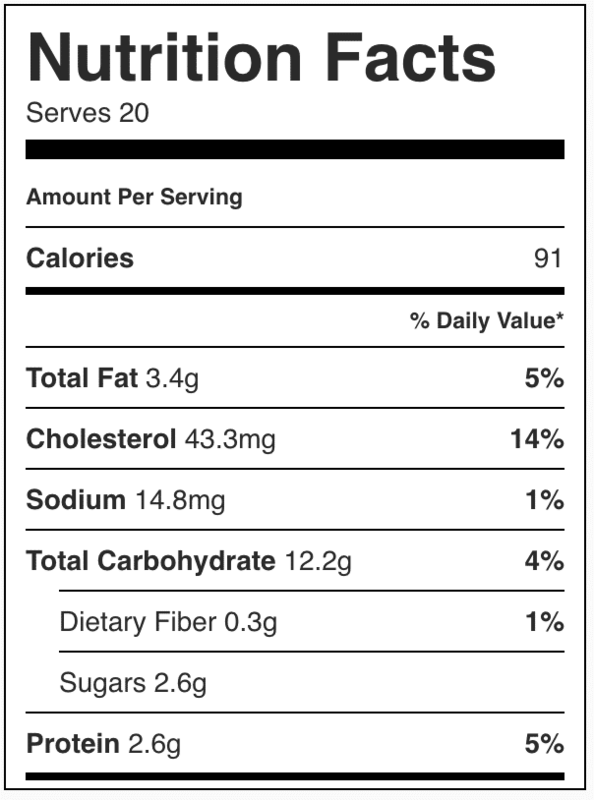 Optional: powdered sugar, syrup, whipped cream -- whatever you want to serve in or on top of your crepes! 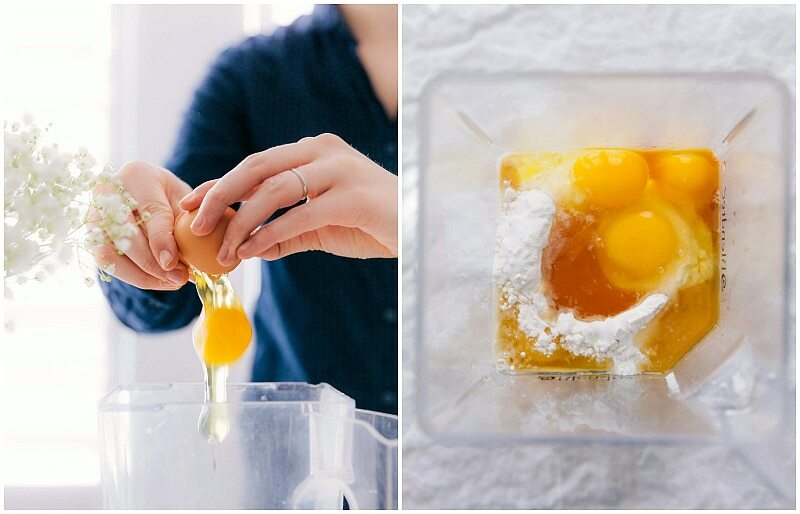 Add milk, flour, sugar, salt, melted and slightly cooled butter, vanilla and eggs to a high powered blender. Blend on low speed until well combined, about 10-15 seconds. 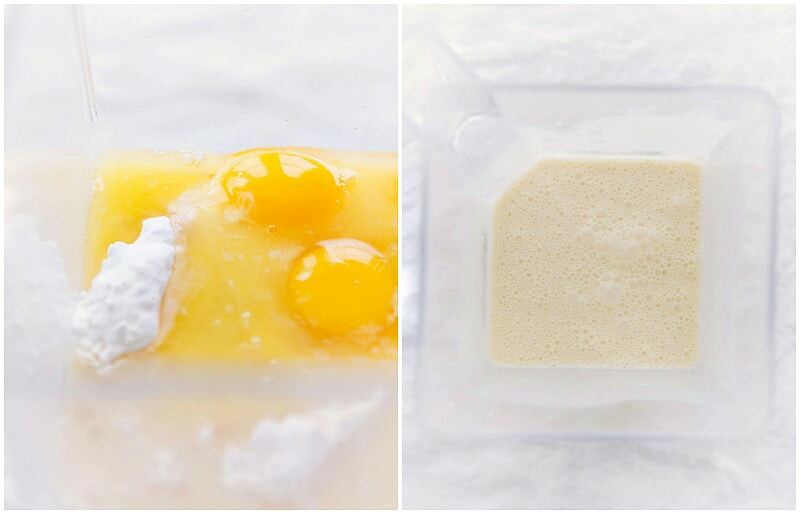 Cut small squares of parchment to separate crepes. This is important so they don't all stick together after being cooked and especially important if you are saving/storing crepes in the fridge for later. Heat an 8 to 10-inch NONSTICK skillet over medium to medium low heat. Remove the batter from the fridge and give it a quick stir. Place a large tray or platter out and put one square of parchment paper down. This is where you'll place all the crepes as they are cooked. TO SERVE: fill crepes with desired fillings and then fold crepes in half, and then half again to form triangles. Sprinkle with powdered sugar, add a spoonful of whipped cream, and drizzle on syrup as desired. TO STORE: let cooked crepes cool COMPLETELY and then transfer the crepes to a large ziplock bag. Seal without any air and store in the fridge for up to 5 days. Yes, definitely! 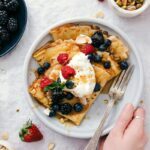 You can stack the cooked, cooled crepes with wax paper and refrigerate them for a few days.You can also refrigerate the batter for up to five days, or freeze it for up to two months. Ps. Since I don’t have a blender, can I use a food processor or mix the batter by hand/with a stand mixer?